Bringing the Mario-Kart-like fun of the recent free-to-play Sonic mobile game, Sonic Forces: Speed Battle to an analog audience, Shinobi7 has just launched a $50,000 Kickstarter campaign to fund Sonic the Hedgehog: Battle Racers, a board game version of SEGA’s mobile hit. Featuring pre-painted miniatures, Sonic the Hedgehog: Battle Racers will allow 2 to 5 players to take on the role of Sonic (or one of his many friends and rivals) in a ruckus race around an obstacle-laden course, while attempting to grab coins, trip up opponents and/or boost their way across the finish line first. The base game will feature five highly detailed full color miniatures of the following characters: Sonic, Knuckles, Amy, Tails, and Dr. Eggman. Also included are a variety of colorful cards, tokens and race tracks. Every expansion set will contain one pre-painted character miniature and their racer profile, while larger expansions will also be available and will include additional track sections. All miniatures will be 40mm scale. The Kickstarter campaign also features various exclusives and Limited Edition items. No strangers to licensed properties, last year the Shinobi7 published a deckbuilding game called Tokyo Ghoul: The Card Game based on the popular manga series of the same name. They also released the My Little Pony RPG series, Tails of Equestria: The Storytelling Game. Shinobi7 has chosen to run a simple, straight-forward campaign with just a solitary $100 pledge level which gets you the game, Kickstarter Exclusive content and any unlocked stretch goal content. Shipping to the continental US is an additional $10 – $15, $50 to Alaska, Hawaii, and Puerto Rico. Shipping costs vary for other countries. I rather enjoyed Sonic Forces: Speed Battle and thought it was one of the most enjoyable Sonic mobile games to be released in the past few years. 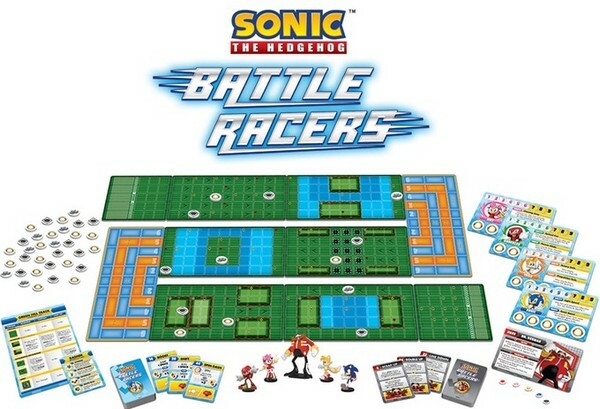 Sonic the Hedgehog: Battle Racers looks like an entertaining board game port which not only captures the look and feel of the original game, but also comes with some great looking miniatures. While I’m curious to experience how it plays in analog form, I’m not sure I’m ready to drop $100+ in golden rings before getting a really good feel for the game first. For more information, visit the campaign page. The Kickstarter campaign is currently live, and will run until March 2nd. UPDATE: $50 and $150 Pledge Levels Added! It seems that the KS page has undergone some changes since it launched and now there are THREE different pledge levels! As you might have noticed, we just made a few big changes on the campaign page itself! Where yesterday there was only one pledge level, we now have three awesome pledges. One at $50, allowing you to get into the game at half of the initial price, and the other one at $150 getting you everything the game has to offer at a discounted price! Whichever pledge level you find to your liking, we promise a blast at the gaming table! Yesterday, we started with some of the SG’s being unlocked as Optional Buys. That idea is discarded! All SG’s we have planned for this campaign will be freebies! This also means that the Plastic Rings and Shadow “Oil Ocean” expansion will be included for free in pledges of $100 and $150 once unlocked!